Israeli troops punched into south Lebanon on Wednesday as warplanes flattened buildings, including one thought to hold Hezbollah's top leaders. Meanwhile, the luxury cruise liner Orient Queen arrived in Cyprus' port of Larnaca early Thursday with about 1,000 Americans aboard, completing the first trip in a massive operation to evacuate thousands of U.S. citizens from war-torn Lebanon. Hezbollah denied that any of its "leaders or members" died in the strike in the Bourj al-Barajneh district of south Beirut. The explosives did not blast a leadership bunker, but a mosque under construction, the group said in a statement faxed to The Associated Press. The strike was the most dramatic action on a day that saw Israelis clash with the guerrillas and launch strikes that killed an estimated 40 people. Israel broadcast warnings into south Lebanon telling civilians to leave the region, a possible prelude to a larger Israeli ground operation. In Cyprus, the Orient Queen's arrival marks the first mass U.S. exodus from Lebanon since Israeli air strikes started more than a week ago. Thousands more Americans are still waiting to leave Beirut. Government officials hope to evacuate more than 6,000 more Americans by the weekend. Once the evacuees arrive in Cyprus, it's up to them to make arrangements to continue on to other destinations, including the United States, reports CBS News' Kristin Gillespie. Other countries appear to be evacuating more their citizens more quickly. "Today in the port there are six chartered ships that are taking an estimated 30,000 Canadians out of the country, all in one go," reports Gillespie (audio). "The British and the Europeans are also continuing to evacuate their citizens. They began these efforts last week." Israeli forces killed 13 Palestinians on Wednesday in fighting in the Gaza Strip and the northern West Bank city of Nablus as the army pressed forward with a wide-ranging offensive against Palestinian militants. The raids were the latest in the three-week operation that began after Hamas-linked militants captured an Israeli soldier after tunneling from Gaza into Israel and attacking an army post. Israeli sources tell CBS News that U.S. Secretary of State Condoleezza Rice will make a one-day visit to Israel on Monday, then go to Asia and come back to Israel on her way back one week later. She will meet with United Nations Secretary General Kofi Annan on Thursday in New York. Two Arab boys, ages 4 and 8, were killed in a direct hit by a Hezbollah rocket on the mainly Arab town of Nazareth in northern Israel, revered as the hometown of Jesus. The Katyusha rocket also wounded 18 people, Israeli authorities said. Politically, Hezbollah's killing of two Arab children may do more damage to the group than any Israeli air strike, reports CBS News correspondent Lee Cowan. But Hezbollah — known for its stubbornness — doesn't seem to care. "We're going to continue to fight because this is an imposed war against us, we're under occupation, we're under threat, we have only one choice, to defend, with our dignity, with our pride," said Ibrahim Mousawi, a Hezbollah member. The group now controls 23 seats in Lebanon's Parliament — including two key ministry positions, Cowan reports. But it's been criticized by fellow Muslims for paralyzing the government and using it to promote it's familiar militant agenda. "Sometimes when someone points a gun to your head you have to defend, and you have to resist," Mousawi said. Meanwhile, Lebanon's prime minister said Wednesday that 300 people have been killed, 1,000 have been wounded and a half-million displaced in Israel's week-old onslaught on Lebanon. Speaking to a gathering of foreign ambassadors, Prime Minister Fuad Saniora said he would seek compensation from Israel for the "unimaginable losses" to the nation's infrastructure. He also made an urgent appeal for an end to the fighting, saying Lebanon "has been torn to shreds." "Is the value of human life in Lebanon less than that of the citizens of other countries?" he asked. The international Red Cross and U.N. officials said Wednesday they were seriously concerned about civilian casualties in escalating violence in Lebanon and Israel. "Starting Thursday, the U.N. takes up the issue of the crisis in the Middle East when the Secretary-General returns to headquarters and briefs the Security Council, with the three-person shuttle diplomacy team at his side, on prospects for peace with options that include the call for a ceasefire, a new multinational military force, or reinforcements for the U.N. observer team already on the ground in Lebanon," said CBS News foreign affairs analyst Pamela Falk. "The shuttle diplomacy team headed by Vijay Nambiar and includes Terje Roed-Larsen and Alvaro de Soto, will brief the council as well as Secretary of State Condoleezza Rice on their meetings with officials from Lebanon and Israel," added Falk, "but the difficulty for world leaders gathered at the U.N. will be to find a negotiated solution that includes an end to the violence at the same time as it reduces the continuing threat of Hezbollah attacks against Israel." In a swipe at the international community, particularly the United States, which said Israel was acting in self-defense, Saniora asked: "Is this what the international community calls self defense? Is this the price we pay for aspiring to build our democratic institutions?" "Can the international community stand by while such callous retribution by the State of Israel is inflicted on us?" he added. "We will spare no avenue to make Israel compensate the Lebanese people for the barbaric destruction" inflicted on the country, he told the gathering, which included U.S. Ambassador Jeffrey Feltman. His comments were the first casualty figure officially announced by the government since Israel began its campaign July 12 after Hezbollah guerrillas captured two Israeli soldiers. Hezbollah's Nazareth attack came hours after Israeli troops engaged in a fierce firefight on the ground with Hezbollah guerrillas inside Lebanon, in a clash that killed two soldiers and one of the militants. In Nazareth, smoke billowed from a building damaged in one of the strikes on the town of 70,000 about 20 miles south of the Lebanese border. Nazareth is the largest Israeli-Arab town in the country and is the center of Arab life in northern Israel. "They're firing at Muslims and places sacred to Christianity," Israeli government spokesman David Baker said.
. "There are shells landing all around us. We can hear the constant boom of outgoing artillery. Israeli tanks on the road and on the border are engaged in this firefight," Logan said. Two soldiers and one militant were reported killed. In all, 15 houses in the Najdeh neighborhood of Tyre were destroyed Wednesday in an air strike by Israel apparently determined to stop the frequent rocket fire from this region. 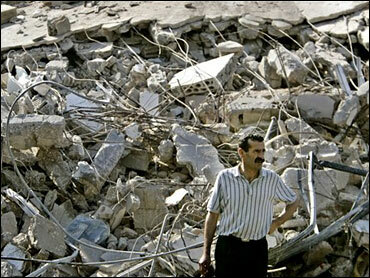 Israel's bombardment, now in its second week, has wreaked its worst damage in the southern Lebanon. Warplanes have knocked down bridges and roads and turned villages into ghost towns as civilians flee, leaving the area for Hezbollah guerrillas who continued to fire rockets on Israel and engage any ground force that advances across the frontier. The campaign has wreaked havoc with the lives of people in a farming region that is traditionally poor. Israeli forces also killed six Palestinians on Wednesday after tanks moved into a refugee camp in central Gaza under cover of machine gun fire, the latest incursion in Israel's three-week military push in the seaside territory.